I promised Kadie (Seven Alive) that I would post a pesto recipe, so this is the first try. I say it's the first try because this was not a conventional pesto recipe, and I definitely want to do one of those for her. This recipe came from the Moosewood Restaurant Low-Fat Favorites cookbook. Throw all of that into a food processor, give it a whirl, and that's it. When you drain the pasta, reserve a cup or so of the cooking water in case the pasta ends up being too dry for your liking. We had this over fusilli. I added dried chili peppers and Parmesan cheese. It was definitely fresh and bright and lovely-tasting, but it wasn't what you would normally expect with a pesto. It ended up being much lighter. It definitely has it's low-calorie, low-fat place, but I'm still hankering for a full-fat classic version. My favourite hockey team (Boston Bruins) won the big trophy this year (The Stanley Cup, named after Lord Stanley - what heritage, lol) and one of the players hails from Welland which is just the next town over. So yesterday they had a big do, named it Daniel Paille Day (that's the name of the player), and got us to put on Bruins jerseys and shirts in 80-degree weather. Check out this cutie patootie. I have found a natural weed-killer spray. I really hate weeds and when I try to pull them from the gravel dog pen I just end up with cut fingers (yes, even with gloves on - I'm just that talented) and sandals stuck with dog poop. Until now! I have tried a bunch of natural concoctions. Obviously, I don't want to spray an herbicide in the pen and then have the dogs walking on it, so natural was a must. The winner killed the weeds in less than 24 hours. The recipe came from Full of Great Ideas. That's it. Fill mostly full with the vinegar, add salt and the soap. Give a pretty good shake to combine and then spray away. This ended up being MUCH easier than pulling the weeds. I am just ecstatic. Never did anything so crusty and dead look so beautiful!! This is a super simple necklace. I used silver beading wire (.3 mm) and just alternated large beads with small in the centre portion. Then dark purple with lighter pinky/purple for the left and right sections. For the findings at the end, I started with crimp beads. This week is the first time I've tried using them, and they are a blessing. Finally, I just decided to pick something, anything, and settled on a half apron. So here it is. I found a tutorial from Craft Faves and got to it. I had bought the cutest fat quarters from Walmart of all places (don't know what a fat quarter is? neither did I,...go here to find out) and decided to try a trendy-looking black on black. I had my cup of tea, all of the lights in the room turned on, and I was ready. Now I won't go over the steps here, you'll have to check out the tutorial for that, but if you're a newbie seamstress, then I'll fill you in on all the things NOT to do. The tutorial starts with the ties. Sounds easy. Fold wrong sides together, sew, turn right side out. Easy peasy. Insert a long stupid silence here with furrowed brow and a definite 'huh?' expression. I did okay folding, did okay sewing, but turn that narrow tube around? How the heck do you do that? I googled. It still sounded hard. In the end, I got the biggest needle I have (I think it is called an upholstery needle), double threaded it, and made a stitch in one end of the fabric tube. Then I threaded the fabric tube onto a knitting needle. Once the knitting needle was inserted, I snaked the upholstery needle through until it came out the other side, taking care not to actually poke through the fabric at any point. I pulled out the knitting needle and went to the back end of the tube, where the stitch was (NOT where the needle now was). I pushed the fabric at the back end in a bit with the knitting needle. After that I helped it along by pushing with the knitting needle while I pulled on the upholstery needle from the other side. Sound confusing? Yeah, it took some finesse. Eventually I got it and the second one went more easily along (isn't that always the way). The other spot that got me was the pocket. To this moment, I still do not know what I was supposed to do with that pocket:: turn this way, then turn that way. ??????? In the end I just folded each side under twice so the fabric wouldn't unravel, and sewed the pocket to the apron. It wasn't exactly the way it was supposed to go, but it did the trick. I was a bit limited by the fat quarter so I believe I will get more fabric for my next project to open up my options a bit. I think the stars must have aligned because somehow I have been extraordinarily fortunate enough to receive two awards this week from two fabulous bloggers. 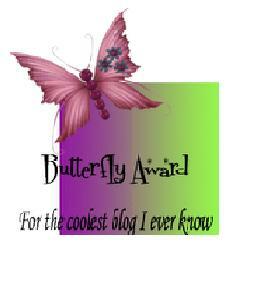 Kadie from Seven Alive awarded me the Butterfly Award, and now Amy from One Artsy Mama is honouring me with the Liebster Award. That these super talented gals thought of my little blog when they were looking to showcase someone has left me feeling grateful and special. 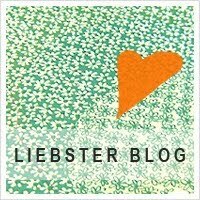 The Liebster Award is geared to providing exposure to smaller blogs (less than 300 followers is the definition that is given). 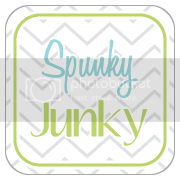 Just Our Style - Brandy is a wife and mom who loves to do crafty things on a budget. Style Burb - Yvonne likes to share ideas for keeping a stylish, well-functioning, comfortable home. Health Eating for Ordinary People - Rivki makes the most mouth-watering, health recipes. Balancing the Dream - Jess is a home decor crafter, a wannabe photographer, and a mommy on the go. This is the second little project made from the Halifax beads (makes them sound like an actual type of bead, doesn't it). I am much more pleased with this set. The round beads have a mother-of-pearl opulence to them but are mostly grey instead of having that rainbow spectrum. These were beads I already had. The funkier black and silver beads were from the recent Halifax trip. I did the bracelet and necklace on stretchy jewelry cord because that was all I had hanging around. The bracelet is just tied at both ends and then held with a little drop of glue-gun glue. Then I tucked the knot into the nearest bead hole to hide it. The pendant would look nicer with a different cord I think, something silver maybe, but I like this version too. It's a little longer than my usual length which I'm liking. The earrings were a bit of a challenge. The long dangly pair are nice but a little long for everyday. I tried playing around with a couple of designs. These are studs with the Halifax bead on either side of the round stone. These were too big for my ears and made my earlobe flop back. NOT attractive, lol. I tried removing one side of the earring to see if it would sit better. It didn't. (By the way, does everyone's face look that hairy in photos? I swear I don't have a beard in real life). Finally I settled on a simple stud and this seems to have worked for me. Well it didn't take me long to dig into those new beads from Halifax. I had seen the Anthropologie necklace knock-off on two different sites: Amy from One Artsy Mama and another from Beverly at Flamingo Toes so I thought I would give it a shot. I wanted to add more of the large beads to the necklaces so I alternated the chameleon beads that were sort of green and brownish-orange. They have a shimmery multi-colour effect so I used some seed beads for in between that had that same quality. In the end, I like this necklace but I made a mistake that will bug me every time I wear it. I put a centre bead on the shorter necklace and not on the longer necklace. It makes the longer necklace hang a little funny and my obsessive nature doesn't like it. Next time I'll make sure the longer necklace has that centre bead. See what I mean? The longer strand looks wonky. I also did some earrings and a bracelet to match. I was pleased with the bracelet and earrings. I flipped the longer section of the necklace over my head and I really like the single strand much better. I think I'll separate them and find a larger charm to hang from the unloved longer strand. Maybe that will fix it. In the meantime, more beads and more jewelry tomorrow. Stay tuned. I love pretty much anything blue. I love how these have a frosty finish to them. These were too funky to pass up. These beads take on different colours depending on the light. These look a little more purple than this in real life. Now I just have to figure out what projects to conquer with these beauties. Beverly and Amy each do an anthro knock-off necklace that might just be the winner.